Here's a small demonstration painting I did in the garden of the farmhouse we were staying in France. Thanks to one of my students, Monique Carr, who took some photo's so you can see the painting in process. 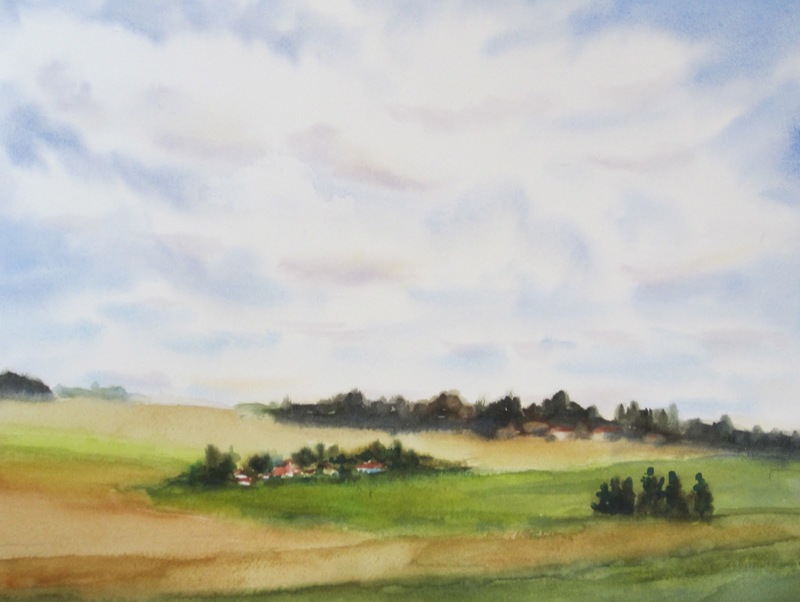 Typically I paint watercolor is a traditional approach: light then dark, large areas then small, vague areas, then specific. 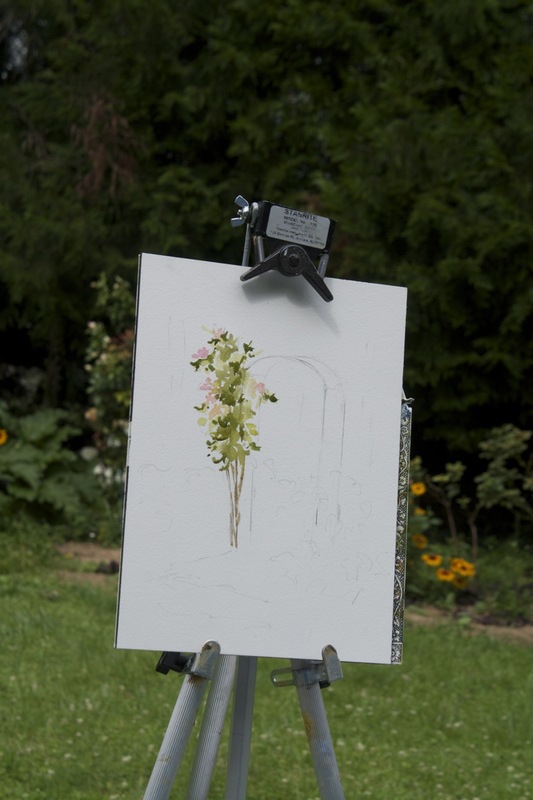 However, when I have scenes that include flowers, I like to get them in early so that they are on top of the bright, clean, white paper so they remain as clean a color as possible. 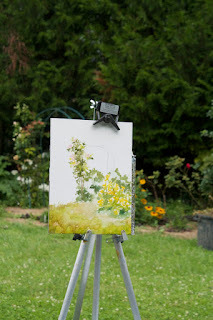 I added in more of the light yellow flowers and light foreground passages. Started adding in some of the darks in the background that serve as a foil for the light foliage in the foreground and around the arbor. Painted around the arbor negatively to allow that to be lighter when all was said and done. Painted the arbor in later. It was extremely damp so things were taking forever to dry. Ended up having to do another glaze on the background to further darken it once back in the studio. This is the second one of my new series "European Escapes" from a small town I was passing through during my recent trip to France. I liked the bright pink rose bushes against the grey building and sky. Well this has been a crazy month. I've been working on 6 commissions and then spent a couple of weeks in France teaching a workshop, so I have gotten out of my normal rhythm of working on my own body of work. Every once in awhile when I feel like I'm starting to drift, it's time to reel myself back in and regain focus. As the month is wrapping up and I'm looking to the remaining 5 months of the year, it's a good time to clear the decks and refocus on what I want to paint in the coming months. I have lots of still life ideas (and even more new still life "props" I picked up during "brocanting" which is a kind of combination antiquing/garage sale that's big in France). I also got to see some inspiring work by Chardin and Henri Fantin-Latour while in Paris so I'm excited to get back to my floral/still life series. But I realized during the workshop that I've been away from landscapes for several months and now have lots of new inspiration from the France trip so I want to get back to more landscapes as well. So many things to paint, so little time! My solution to "getting back in the groove" is to continue to work on the still life series but add to that a new short term project "50 European Escapes" which will be a series of small paintings ( 6 x 6 or 6 x 8) based on my new France reference materials as well as some Italy inspiration in preparation for my upcoming workshop in October. These can be some quicker studies to keep my landscape skills fresh and to possibly be translated into larger works later on while not taking away too much time and attention away from the more complex, larger still life pieces that I want to pursue. Well that's the plan for now. We'll see how that works. Today's post is the first in the "European Escapes" series which I painted yesterday. Stay tuned for more to come. You may have noticed my blog has been quiet for the past 2 weeks. 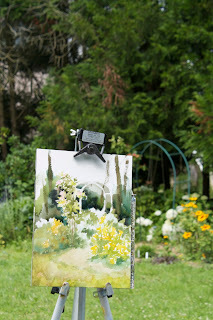 I was away in France teaching a painting workshop at La Bonne Etoille in the countryside, about an hour outside of Paris. We stayed in a charming farmhouse of our hosts Kippy and Jerome. They did a wonderful job providing us with an authentic French experience and showing us some of the highlights of their region. We all had fun painting, soaking in the french scenery and enjoying lots of good food and wine. 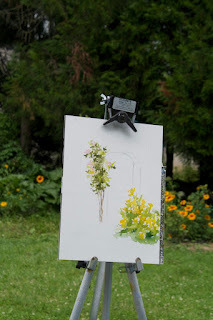 One of the things I love about these trips is getting lots of new photos for painting inspiration which keep the trip memories alive for a long time. I'm excited to get started on some more french scenes when I'm back in the studio tomorrow. I'll be sharing more paintings, so stay tuned. The sunflowers began blooming while we were there so plenty of great photo ops. 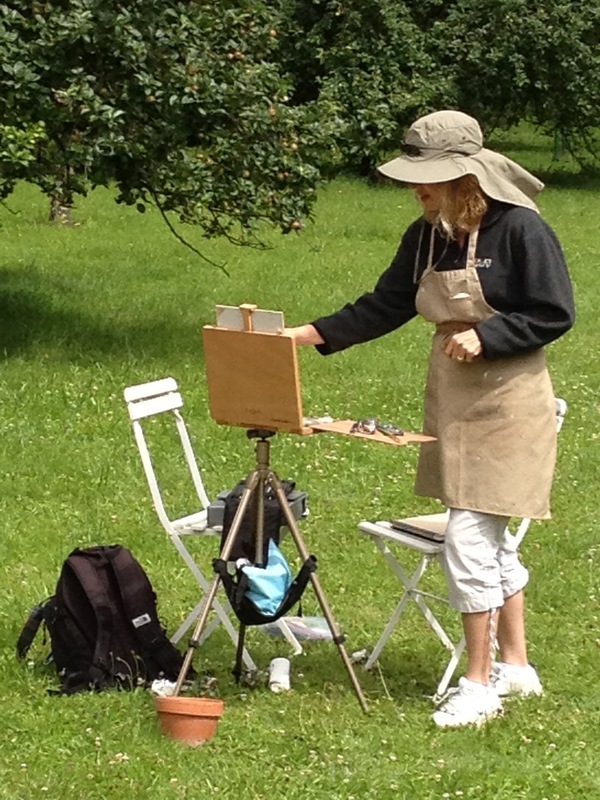 One of my students Monique Carr painting on location. 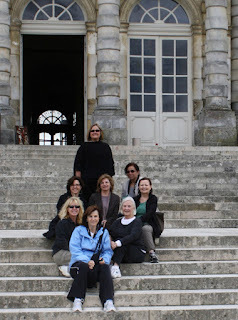 Our group out on an excursions to a beautiful French Chateau Vaux le Vicomte. My next painting trip is Tuscany this October. There's still room available if you'd like to join in the fun. 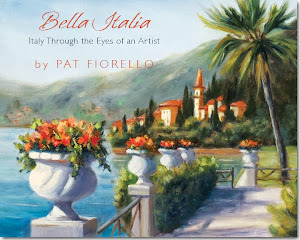 For more info click on Paint Tuscany or email me at patfiorello@aol.com. I'm off on a big painting adventure. Hope to be able to connect in from the road to keep you posted. If not will fill you in on the fun and the paintings when I return. 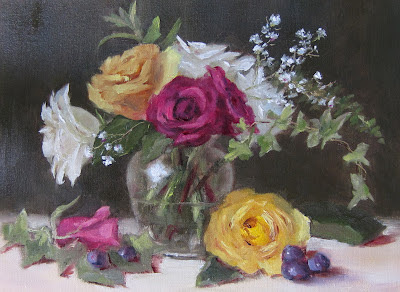 I did this painting from a still life set up a few weeks back. Three different colors of roses, ivy and baby's breath. I've been working on some other commission projects from photo's the past couple of weeks and notice how much I miss setting up my own still lives. My husband made me a new shadow box for my studio so I'm anxious to try it out. 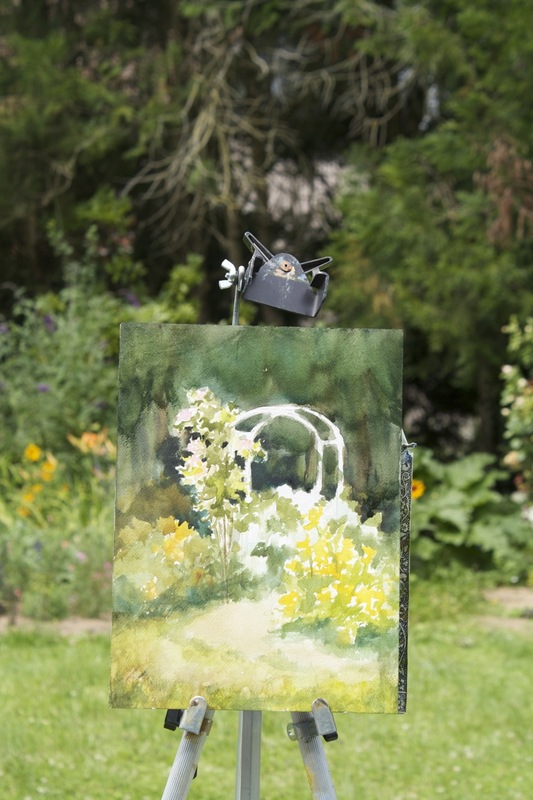 I have plans to paint on location for the next couple of weeks, but will get back to the still life soon.